The third reason I had a good day yesterday (well, the third and fourth reasons, actually) is that I stumbled (thanks, Qt3 forums) onto two excellent Androis/iOS games: Dungeon Raid and Triple Town. Dungeon Raid is a three-match game, but there's so much more to it than that. You gather swords, shields, potions, and gold coins. Monsters also appear in the playing field, and you must trace a path through swords to the monsters to attack them. Tracing with your finger is a tremendously satisfying mechanic in this type of game, and the controls work perfectly here, as precisely as any Android game I've ever played. The symbols at the top of the screen represent skills or one-time use spells, which you acquire as you increase in level (choosing from a skill tree). Filling up any of the various meters (sword, shield, coin) grants you a new skill (or new skills/upgrades to choose from), but you can have only four active, so there are choices to be made. Traditionally, the problem with this kind of game is that the difficulty hits a wall at some point, and you'll quickly die. In Dungeon Raid, though, it's possible to last longer and to die in what feels like a fairer way, because the skills (which have cooldown periods) can be quite powerful, giving you a chance even as you reach the higher levels. My favorite moment? 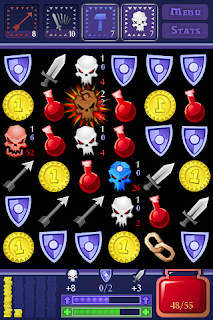 Tracing a long, long trail through swords and enemies, sometimes 15 tiles long, and wiping out ten enemies in one turn. It's incredibly satisfying, and quite a charge as well. It's an absolutely terrific game, highly polished, and it is perfect for a 10-15 minute session. It also looks fantastic on a tablet as well as a phone. Like I said, versions for both iOS ($2.99) and Android ($1.99) are available. Next, another game available for both platforms (as well as Facebook and Google+): Triple Town. It's also a match-three game, but again, that's a vast undersell. In Triple Town, you're trying to match landscaping, basically--grass, bushes, trees, churches, houses, etc. It's all part of building a town, and when you match three similar items, they compress into one item (leaving the other two tiles free again). The more items you match at one time, the bigger the subsequent item. As an example, if you match three bushes, you wind up with a tree. If you matched four bushes, you get a larger tree, etc. Simple, but clever, and the feeling of "building" is very satisfying. This game requires more patience and more careful planning than most match threes, because the collapse into one item occurs at the last square involved in the match. So it's slower-paced than Dungeon Raid, and games last a bit longer, but it's every bit as enjoyable. One negative note: for the iOS and Android versions, there's a turn limit, and to remove it you have to pay the entirely ridiculous price of $6.99. I've only played it enough in one day to hit the limit, and you regenerate a certain number of turns per hour, but it's still silly.